As many of you know, one of my favorite things is to give back to others. 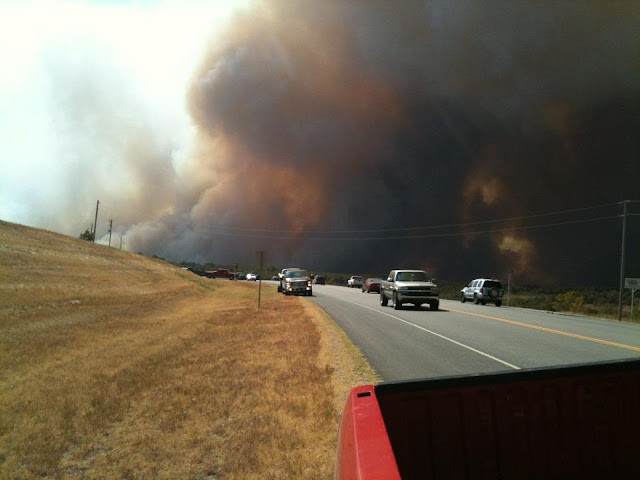 Over the weekend Oklahoma suffered catastrophic damage from wildfires. In the county where I grew up, 209 homes were lost and more than 58,000 acres burned. This was just one county. I don't have the numbers for the entire state, but it was bad. Early last week I was given the opportunity to team up with Elmer's and #Champions4Kids for Bag it Forward. The mission is to purchase quality school supplies and donate to kids in need. At that time I had planned on donating the items to some girls from church. Then, the fires happened. Word got out that 47 students from Mannford, Ok alone lost their homes, and everything in them. Mannford is a small community, 47 is a BIG number of students. The call went out and started circling around Facebook that school supplies were needed. I knew this is where I needed to turn my focus. A dear, sweet, friend of mine will be collecting donations and then taking them to her friends in Mannoford later this week. Yesterday we packed up our car and headed to Walmart to see what we could get. Like all shopping trips, I looked through the sale ads and made a list of items I wanted to get. Since I do not know the ages of the children affected, I wanted to get a range of items. Champions for Kids has made it easy for everyone to donate with their #BagItForward campaign. In most Walmart stores you will find prepackaged bags of school supplies. Inside the bags are scissors, notebooks, pens, pencils, crayons, markers and so much more. You will also find coupon books inside. Also, in some Walmart stores, you will find donation bins right in the store! How great is that? Even if you are only able to purchase one box of crayons, just think of the child that will be given that box. The purpose of Champions for Kids is to mobilize MILLIONS to help. Your one box of crayons, when paired with my on box of Kleenex and "Susie's" package of pens, etc..that then becomes everything that child needs! Don't think of it as "Oh I can only get one box, that is not going to be much help." Think of it as "I can only get one box of crayons, but I know this will help so much when paired with others donations." Trust me, one box of crayons changes the world to a child. I will be donating to the children of Mannford, Ok. I also still plan to donate to the girls in my class at church. I will be posting about my donations next week, so stay tuned! I encourage each and every one of you to go out and purchase at least just one package of something (the pencils were the cheapest items I bought at just $0.38/10pk. ), and help make a difference to a child in your community! To learn more about Champions for Kids, check them out on Facebook and Twitter. You can also learn more about the awesome efforts Elmer's is making to kids in need on their Facebook page and Twitter.